American manned Mars expedition. Study 1985. A Lagrangian approach to Mars exploration was proposed in June 1985. This would use the L1 sunward point of equal Earth/Moon/Sun gravity to assemble and refuel a large Interplanetary Shuttle Vehicle spacecraft. After being boarded by a crew brought up from earth in a small shuttle, the ISV would maneuver into a series of moon/earth flybys. These would be used to sling the spacecraft toward Mars with minimal propellant expenditure. A further modest propulsive burn would park the ISV at the Mars/Sun L1 point. Such a reusable Interplanetary Shuttle Vehicle would provide a home for astronauts on the voyage to Mars and back, and be more flexible than the Mars Cycler concepts, at the expense of a modest propellant requirement. 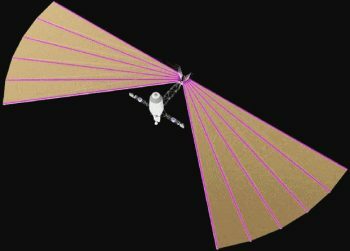 The concept was demonstrated using the ISEE-3 satellite in 1998. Family: Mars Expeditions. Country: USA. Agency: NASA. Bibliography: 591.